I can`t understand why not all people speak Norwegian. That is so simple for me. When I was 3 years old I spoke Norwegian fluently. I had no teacher nor books. My mother did not sit with me and tell how to pronounce the words. It came to me the natural way. But when I shall speak English I have to go to school. I need a teacher and books. And still I cannot speak it properly. Excuse my bad English. I was born on a farm in Varhaug in Rogaland in 1938. 45 kilometres south of Stavanger. I have allways been interested in art. But I have no education in art, and I am totally selfmade or autodidakt. From I was 20 I have been evangelist in Norwegian Lutheran Mission. Let me say it in this way: If you take the art away from me, you take very much. But if you take Jesus Christ away from me,-you do`nt take very much. -You take it all. About Norwegian Lutheran Mission:- (NLM) is an independent, Evangelical, Lutheran organisation, committed to the inerrancy of the Bible as the Word of God. NLM was founded in 1891 with the purpose of sending missionaries to China. Presently NLM is one of the largest mission organisations in Europe. NLM is working under the motto The World for Christ. Our vision is to proclaim the message of the Bible to people abroad, and in Norway. Our aim is to empower people to a legitimate service in the Kingdom of God. ” Before your very eyes Jesus Christ was clearly portrayed as crucified. Odd Dubland was born in 1938 on a farm in Jaeren,on the southwest coast of Norway. From his early childhood, Odd has had a great interest in art. Formal education in this field was not available, so he has developed his painting skills by practice and self-study. He built his first studio at his homestead in Dirdal first in 1981. In 1995 he built a new larger studio and now has both an art gallery and painting studio at the homestead. Although Odd Dubland has created a few expressionistic works, he is true to naturalism. 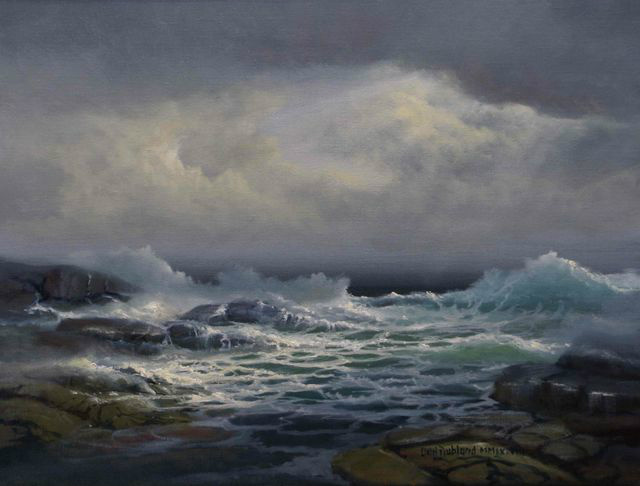 He is well known as a seascape and landscape painter. He feels that there will always be a place for the classic approach, both in painting and in music. He has also produced a large number of gospel music CD`s through the years. Odd has had numerous one-man art shows. The exhibitions have been very well attended and most paintings were sold within minutes. Odd is the author of two books “Mellom Palett og preikestol” and “På eigne vegar”, in the last one there are about 140 photos of his paintings. In 2008 he contributed about 60 paintings to the book “Himmeltonar” by the nationally known author and poet Haldis Reigstad. Odd Dubland has also been teaching art classes for many years. He has also been a minister in the Norwegian Lutheran Mission all his adult life. Around 1994 Odd Dubland started the “Kristne Kunstneres forening” which annually arranges a 5-day event for artists. This year there are 90 participants registered to attend the art classes and gathering. Try this: Odd Dubland and his daughter Oddrun Helen sing. Are we followers of Christ. We are in a prison in Romania during the Communist era. Among the prisoners there are some Christians who sit there owing to the faith. Officially, they are imprisoned for other activities. Conditions they live in are terrible. They are humiliated and disgraced in the most serious, under punches, kicks, hunger and thirst. The propaganda is in full swing to break them down, both human and spiritual. Especially in front of the christian holidays, the guards try to disgrace those who believe in Christ. Before such an Easter christians asked if they could drop to get worms in food. This Easter becomes terrible. A prisoner dies in the jail . The prison-guards take the dead body and hang it on a cross. I front of the cross, they put a barrel of excrement. Then the Christians were forced to a “communion” with the contents of the barrel. The humiliation was total.Could it be happiness among the Christians?Everything that we appreciate they had lost. Well, a strange joy. Namely that they were part of Christ’s shame and partakers with his sufferings. When I, many years ago, heard this said, I got a sense of shame over my own life. How little I suffer for the name of Jesus Christ. We are on a large Christian meeting. The well-dressed great preacher goes back and forth on the platform and speak. What is he talking about? About Jesus Christ’s cross? No, not much about that. Does he talk about to take up the cross to follow Jesus? No, there is little of that too. The word “grace” is used sparingly. Does he speak about respect and reverence for the three times holy God. No, it is quite absent. He speaks very little about hope, of resurrection from the dead, about a new heaven and a new earth . It is here on earth everything will be good. All problems can be solved, whether it’s illness, money troubles or to find a parking space in the city. You must not say as Job-”Job 1:21the LORD gave, and the LORD hath taken away; blessed be the name of the LORD” Then you are on the defensive! You must think positive! God wants you to be successful!